01. Two Day workshop on Basics on Companies Act 2013 - 1st and 2nd February 2019 The Chamber organized a Two Day Workshop on Companies Act 2013 for the Commerce Department of the Asan Memorial College of Arts and Science. The aim of this workshop is to equip the students with the latest amendments and updates on the Companies Act 2013 and to add value to their knowledge. Mr. S. Ramanathan, Principal of the College delivered the welcome address. focuses and conducts such programs to bridge the gap and provide opportunities for the next generation to explore new avenues while choosing their career path. 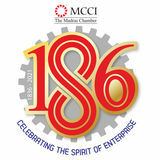 Dr. B. Ravi, Managing Partner, B.Ravi & Associates and Chairperson, MCCI Company law/Corporate matters was the resource person. He enlightened the students with the nuances of the Companies Act 2013 and also generously distributed the book written by him free of cost to the Students on the Basics of Companies Act 2013 covering all the chapters in Company law in Q and A format. The feedback from the Students and the College authorities were excellent. The two day program had an extensive coverage in the local media. 2. Post Union Budget Workshop - 2nd February 2019 A workshop on Central Budget and Finance Bill 2018-2019 was organized at Hotel Raintree following the release of the Union Budget on 1st February 2019 by the Finance Minister, Government of India. Former Finance Secretary, Government of India and Former Economic Advisor to PM was the Special Guest. He set the tone for the event by his insightful analysis of the macroeconomic picture of the budget which is a vote on account budget. He stated that the new Government is at liberty to negate everything in another 2 months when the budget is announced. He touched upon a few concerns apart from discussing about fiscal expansion, GST impact such as farm loan waivers and its implications on micro finance institutions and lending, the nonpayment of mudra loans which will have a great impact on banking institutions and the losses faced by mid cap companies for which this budget has not provided any relief. He concluded by stating this budget has not done anything for the Industry. Mr. K. Vaitheeswaran, Chairman, MCCI Expert Committee on GST & Advocate and Tax Consultant made a presentation on the Union Budget 2019-20 wherein he analyzed the impact of the budget with respect to indirect taxes and GST. He made the presentation with a touch of humor by having the film titles for different aspects of the taxes. His presentation was well received by the participants. Mr. Sriram Seshadri, Chairman, MCCI Expert Committee on Direct Taxes & Partner, Price Waterhouse & Co.LLP made a crisp analysis on the entire range of issues concerning Direct Taxes. The overall response for the program was positive. 03. 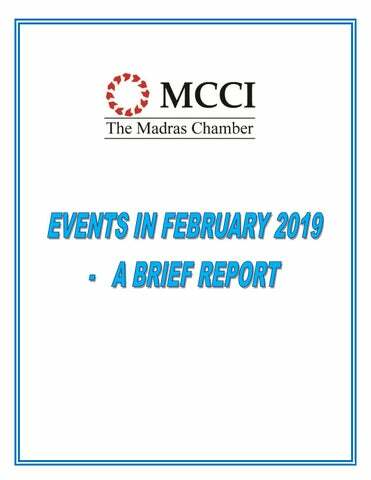 Interactive meeting with HE Mr.Yogesh Punja, High Commissioner of the Republic of Fiji to India - 13th February 2019 The Chamber organized an interactive session with HE Mr.Yogesh Punja, High Commissioner of the Republic of Fiji during his visit to Chennai on 13th February 2019. The objective was to explore the Trade and Investment Opportunities between India and FIJI. Mr. Ramkumar Ramamoorthy, President MCCI extended a warm welcome to HE Mr.Yogesh Punja, High Commissioner of the Republic of Fiji and the participants. Mr. S. N.Srikanth, Senior Partner, Hauer Associates introduced the High Commissioner to the participants and gave a briefing about the event. His Excellency Mr.Yogesh Punja, High Commissioner of the Republic of Fiji addressed the participants on the various positive features of Fiji and elaborated on the numerous incentives offered by Fiji for investors. participants. H.E. Mr. Yogesh Punja answered a few queries and agreed to support those who were willing to set up business in Fiji. The 40+ participants gave a positive feedback. 4. Water today’s Water Expo - 21st to 23rd February 2019 Water Today Pvt. Ltd. organized the 13th edition of Water Expo at Chennai Trade Centre, Chennai for 3 days from 21st to 23rd February 2019. The Chamber, which has been one of the supporting organizations in the earlier editions of the Water Expo in Chennai, as part of its Sustainable Chennai Forum (SCF) activities extended its support for this edition as well. A stall was allotted to showcase the Chamber’s activities of the SCF and this provided a platform to create awareness about the activities of SCF to the participants of this water expo. 5. Interactive Meeting with H.E. Mr.Artis Bertulis, Ambassador of the Republic of Latvia to India – 26th February 2019 The Chamber had organized an Interactive meeting with H.E. Mr.Artis Bertulis, Ambassador of the Republic of Latvia to India, on 26th February 2019 at the MCCI Conference Room Mr. Ramkumar Ramamoorthy welcomed the Ambassador and briefed about the Chamber activities. Mr. N. Ramachandran, Honorary Consul of Latvia introduced the Ambassador to the participants. H.E. Mr.Artis Bertulis, Ambassador of the Republic of Latvia to India briefed about the advantages of Latvia and requested the Indian business community to explore possibilities of investing in Latvia. He added that Latvia is a gateway to Kazakhstan and the country sees itself as a transshipment point for India’s trade. He also added that Latvia offers cost effective logistics by sea and rail to cover long distances and the Capital Riga serves up to 7 million passengers a year. He stated that Latvia welcomes Indian Students and Film Makers. The meeting was attended by 12 persons.